It FINALLY feels like spring! This has been such a long time coming! The days are definitely getting longer - the way that I judge that is by what time the sun ends up shining in my eyes at spin class. A few months ago it was toward the end of the class, and now it's sunny when I leave the house in the morning! The best. I think we have approximately 4 weeks before it gets gross and sweaty. But I am going to MAKE the most of them! I am also hanging out for some form of fruit that's not last year's gross apples and pears. Each week I stalk the greenmarket app. The day rhubarb pops up is going to be an awesome day. There are a few exciting things coming up! The first is that I am going to Alabama next weekend! I am going to meet one of my bestest Insta-friends Kate, IRL. I am SO EXCITED. Mainly because she has insanely cute kids (who likely won't be able to understand a word I say, damn accent), and we can do all of the baking! Next up is that it is kitten season, very very soon! I recently signed up to foster kittens, and we are waiting on a nursing mama and her three babies! Teeny teeny babies. Hopefully they aren't toooo naughty - I am anticipating having to fence off my prop shelf. But still. Kittens!! Something else that I am always, always excited for is pizza. We don't eat a huge amount of meat, so we are always looking for fun riffs on meat-free pizza! This is probably my favourite to date. You really can't beat Roast butternut, sage, and brown butter. This time I paired it with soft roasted garlic spread over the base, and tangy goat's cheese to help cut through the butter. And it's the best. It's a solid member of the pizza night line up, and a really nice change from mozzarella and tomato sauce. 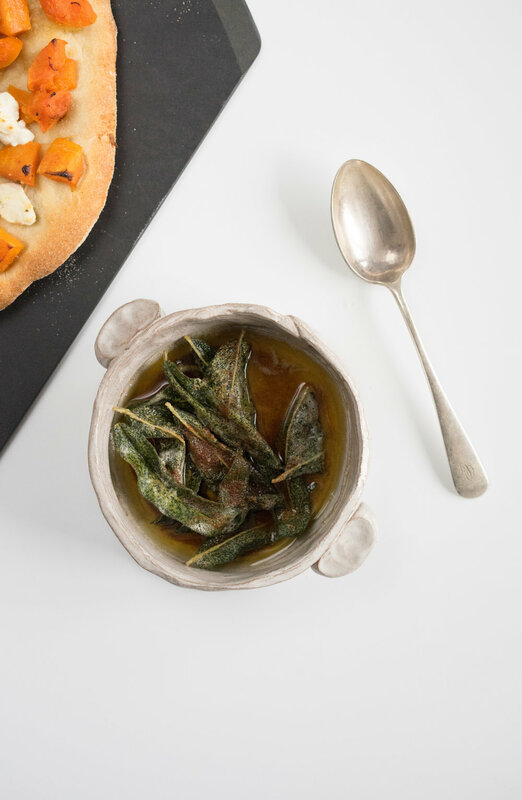 Plus I'm not sure about you, but I really can't go past crispy sage leaves. There's really something about them that gets me going. I have been using a pizza stone to make my pizza for the last year or so. And I tell you what, it makes such a massive, massive difference. If you can make the investment, I highly recommend it. Mine was fairly inexpensive, and it has been a total game changer. It has even travelled with me to a couple of pizza nights! The best. I like to preheat mine in the oven for an hour or so. It means that as soon as the dough hits it, it begins to cook, which results in some serious crispy bottom goodness. I usually take the stone out of the oven and make the pizza directly on it. We do own a pizza peel, but I honestly have managed to throw my pizza at the back of the oven more times than I have managed to neatly slide the pizza onto the stone. We did just get a baking steel though which is a big rectangle as opposed to my round stone, so I will see if we can have more luck with that! Because cleaning melted cheese off the bottom of a 500 degree oven isn't fun. Trust me. Real talk: I use store-bought dough to make my pizza. I get the stuff that comes in a bag, and you just have to give it it's second rise before you use it. I have made my own a couple of times, which always turns out great, but the last few times we have had pizza night we have had about 8 people around, and it's just not feasible for me to make pizza dough for that many people. So if you can find the bagged dough (I love the version that whole foods does), then by all means go for it! Otherwise, this recipe is super simple and easy, and makes enough for two pizzas. Preheat oven to 400˚f / 200˚c. If using, place a pizza stone or baking steel on the lower shelf of the oven to pre-heat. Place the diced butternut on a baking sheet, and coat lightly with olive oil. Cut the tops off of the garlic heads, drizzle lightly with olive oil, and wrap in foil and place on the baking sheet. Bake for 30-40 minutes, until the butternut is soft and starting to caramelise lightly on the edges, and the garlic is very soft. Remove from the oven and set aside. Increase the oven temperature to 500˚f / 260˚c. On a surface lightly dusted with semolina or flour, roll out the pizza dough to a 12 inch (30cm) circle. Dust lightly with semolina or flour to help prevent sticking. Remove the preheated pizza stone from the oven, and, working quickly, carefully place the dough round on it. If you are using a baking steel or large stone, place the dough on a piece of parchment paper on a pizza steel. Alternatively, place the dough round on a parchment-lined baking tray. Squeeze out the roasted garlic cloves on to the pizza dough, and spread out using a knife or offset spatula. Evenly distribute the roast butternut over the surface of the pizza, followed by crumbled chevré or feta cheese. Place in the oven and bake for 10-12 minutes, checking after 10, until the crust is golden brown and starting to bubble. You may need to increase the cooking time slightly if you are using a baking tray rather than a pizza stone. While the pizza is cooking, prepare the brown butter and sage. Melt the butter in a medium pot over high heat. Once the butter has melted, add the sage leaves. Continue to cook, swirling occasionally, until the butter is a deep golden brown and smells nutty, and the sage leaves are crispy. Remove pizza from the oven and top immediately with the sage brown butter (you may not need all of the brown butter, reserve some and add later if it needs a little more). Slice and serve.